Over the last few years, South Africa has been host to many successful sporting and industry events and conferences. From hosting the Football World Cup in 2010 to hosting the International AIDS conference, the largest conference on any global health or development issue in Durban in 2016. Al Gore also chose South Africa as a venue to host his Climate Reality Leadership programme in 2014. Most recently, SA was chosen as the host of the new cricket T20 global league that is due to start in November 2017. So why do these large organisations and boards choose SA venues over venues in the rest of the world? There are endless reasons; I mean, what’s not to like about South Africa? But we have narrowed that list down to 4. A combination of business and leisure, work and play, bleisure is described as the blending of business-oriented travel with personal time. These days everyone is working all the time. Work has become life for a vast majority of people and work travel does not help their cause of having any personal time. Due to this, many people who travel for business, once the business is concluded, stay on and have a holiday and often, they take their family or loved ones along with them. 83% of the people interviewed use time on business trips to explore the region they are visiting. The majority of respondents (60%) admitted having taken bleisure trips in the past, with most (30%) respondents adding at least two holiday days to their business trips. More than half (54%) of travellers that take bleisure trips bring their family members or significant other with them. Six out of 10 of respondents said to be more likely to take bleisure trips today than they were five years ago. With this type of business travel becoming increasingly popular, conference and event organisers need to choose a destination that gives the bleisure guest the best of both worlds. South Africa is the 5th most beautiful country in the world and has such an array of activities that there is something to do for everyone. It is rich in culture yet cosmopolitan; you can drive 45 minutes out of the city and feel as if you are far away from the hustle and bustle. You can get local ‘kasi’ food or find a fine dining restaurant right next door! SA venues have everything that organisers and planners look for; it is a guaranteed one stop shop of a destination! With the world in continuous state of economic despair; South Africa remains one of the few countries that is accessible, financially, to most people. Organizers consider this as well when choosing a venue and destination for their conference; the location needs to give them what they need at the best cost and their attendees must also be able to afford to stay on. For people from Europe, the UK, the USA, Australia, Canada, the UAE and many other countries, South Africa is an affordable country to visit or to stay on in after a conference. It makes business and financial sense that SA would be the preferred location. Organisers can come and host their event and have a holiday at a lower rate than in their own countries. In some of the countries mentioned above; it is more expensive to travel locally than to buy an international ticket to South Africa. More than the flights and event arrangements being affordable; the other amenities are also reasonably priced. Accommodation, food, entertainment and transport are pocket change to some of the people from these countries. There is no doubt that South Africa has the most beautiful weather in the world! The Europeans have such a lack of vitamin sunshine that even the SA winters are more appealing to them than their European summers. The unmanageable heat in the Middle East make our summers look like child’s play compared to theirs; at least we can go outside in the summer. When travelling far for a conference or event, you want to be comfortable, not be in extreme cold or heat and you also want to be able to partake in other non related work activities. Hosting an event in a country with moderate temperatures also lessens the chance of attendees and their families getting ill.
South Africa has the ideal climate and even in extreme heat or cold, there are activities to be done and events and conferences are still able to go on. We may be considered a 3rd world country, but we have 1st world facilities. The stadiums that we built for the 2010 World Cup, our award winning airports, our globally recognized hotels and restaurants and our state of the art conference facilities are but a few of the many amenities that our country provide. It’s no coincidence that the Confederations Cup, the Indian Premier League , the Joburg Open, Tourism Indaba, United Nations For Women In Science and many other renown organizations have chosen South Africa to host their conferences and events. The organisation’s reputation is at stake if the standard of the conference and event is poor; so their trust in our institutions say a lot! 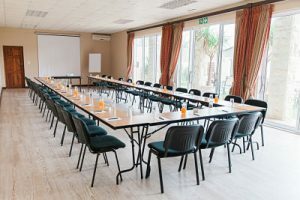 It is well known that South Africa is a preferred holiday destination for many but it is a lesser known fact that SA venues are also the preferred choice for global conferences and events. Our beautiful country, its people and the facts above make us the perfect country to host your next conference in. Click the button below to start planning your next conference, the South African way!